When we first told Lucas that I was pregnant and that there was a baby growing in Mommy's tummy we didn't really expect him to understand what was going on. 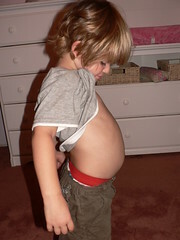 His response to the situation was to tell us that there was a baby crocodile growing in his tummy, too. Of course we found that adorable. As the months have rolled on, Lucas has surprised us by continuing the story of the baby crocodile. He will often tell strangers at Barnes and Noble "Mommy has a baby in her belly, and I have a crocodile!" When he was "less than thrilled" to find out that he was getting a sister and not a brother, he went around telling people "Mommy is having a baby girl, but MY baby crocodile is a boy!" He's even gone so far as to insist that we need to start taking pictures of HIS growing belly... which is really just too cute not to do.